The Turner Report: 3-25-11: Intervention in Libya, O'Keefe Needs Your Buck, and the Cherry Blossoms are Here! 3-25-11: Intervention in Libya, O'Keefe Needs Your Buck, and the Cherry Blossoms are Here! Spring is here -- but you've probably noticed it doesn't feel that way. Is the weather a sign, now that Barry's returned to Washington to duke it out with Congress over the budget and Libya? We're REALLY hoping his recent defeat at the mercy of an Oval Office door isn't a sign of what's to come. His anti-air capabilities crippled, a defiant Colonel Gaddafi is lashing out at Western forces for threatening his advance on rebel-held territories. France led the way, quickly followed by a barrage of U.S. and British sorties. Shooting down that rebel jet AFTER the U.N. resolution wasn't such a great idea, eh, Colonel? A deal has been reached to have NATO take control of the mission... but America is still left with a significant role. Dubya redux, anybody? The folks on the Hill are already grumbling about the legality of the latest U.S. intervention. Cue Joe Biden! We knew Dennis would have something to say. 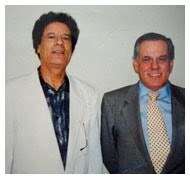 Finally, a Brazilian plastic surgeon says Gaddafi went under the knife. Aftershocks continue to rattle Japan two weeks later. Sadly, we learned about the first American confirmed killed by the powerful earthquake in Japan. Taylor Andersen, of Richmond, VA, had been living overseas since 2008 and was a teacher. The FDA has banned Japanese food imports from localities around the crippled nuclear plant. The situation at the plant is nowhere near the official death toll, which has surpassed the 10,000 mark, and many more are still missing. Secretaries Clinton and Gates are scheduled to be Sunday daytime besties on Meet the Press and Face the Nation. And, yes, Libya will be the topic of discussion. Both will also be busy next Wednesday briefing members of Congress. Pressure is building on Senate Democrats to work out a compromise with Republicans on Social Security. Next week there may be a vote on "solutions" that include raising retirement age and scaling back benefits to the wealthiest seniors. Harry Reid is standing his ground, arguing that tampering with the program will endanger the elderly. In other fiscal news, conservatives are open to deep cuts to the Pentagon. Just to be clear to the American people -- they are NOT going soft on defense! T-Paw made his special announcement that he would indeed be the most boring GOP candidate on Facebook. Yawn. But wait! Michele Bachmann is "in it for 2012," as in she's still thinking about it, teehee! Please, please, run, sister! Sarah was in Israel for some reason. Maybe she believes she can win over all those Israelis who really live in Iowa. Newt keeps flip-flopping like there's no tomorrow, and Rand Paul is keeping us guessing on which Paul will end up on the ballot. The GOP primaries will undoubtedly provide us with endless entertainment -- get that popcorn ready! Claire McCaskill is still in hot water for using taxpayer money for political travel -- a big no-no. The NRSC already has a website and ad up. Good hustle, you guys. The Missouri senator is up for re-election next year. Can she weather this turbulence? Haley Barbour is having some pre-campaign plane trouble, as well. Yeah, like that's ALL over the news. 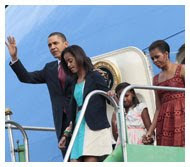 Obama wrapped up his three-country tour of South America, stopping over in Brazil, Chile, and El Salvador. He emphasized America's commitment to strengthen economic ties to the region by with mutual trade and increased exports, while creating jobs back home. Michelle received some flattering comments from Chile's president. How could anyone possibly forget the second battle for health care reform? It's the one-year anniversary of "Obamacare," as detractors call it. Nancy Pelosi held a press conference to mark the occasion. Politicos took note of the heavy-hitters that weren't in attendance. Just a few scheduling issues, right? A year after the vote, one former Michigan congressman still attracts nasty looks at the airport. Berlin and the world mourned the death of Knut, the 4-year old polar ice bear who died suddenly. Apparently the city's natural history museum has already begun the process of stuffing Knut for display. Many of his fans are disappointed (also, ew!). For many, gaining employment has just been a gut-wrenchingexperience. However, if you've got some background in journalism and have a knack for politics and the legislative process, you might be in luck. Do we have the Michele Bachmanns and Steve Kings of the world to thank? You tell us, you politico-journo-genius, you! It's hard out there for a pimp, right, James O'Keefe? Things have come full circle -- now the conservative muckraker is $50k in debt and is asking for any and all donations to continue making "videos," if you get our drift. Quite the life, eh? Turner Central peeps fly in and out of Reagan Intl. all the time. This week's tower controller incident has us now wondering (and praying) whenever we fly. The NTSB is investigating and the air traffic controller has been suspended. Legendary actress Elizabeth Taylor died in Los Angeles at the age of 79. At her request, she was late for her own funeral service. Rest in peace. In other milestone news, William Shatner turned 80. Glenny's contract with the Fox News Channel expires at the end of the year and there's talk he'll jump ship and start his own channel. Sorry, dude, you're no Oprah (but maybe Michael Steele is). The only people who would bother to follow the Beckster are the gold buyers and some laughable "university students." A cry out for attention or simply a anger management issue? Chris Brown was displeased, to put it lightly, about Robin Roberts' line of questioning. Brown later apologized and Roberts has extended an invitation to reappear on GMA. Biebs is sticking by his duet partner. The wittle blue bird turns five years old on Monday. The first (non-automated) tweet is here. You think Lady Gaga serendaed the Twitter employees this week? Our Internet Overlord, Facebook, has reached a milestone. More than half of Americans 12 and older are addicted to the social networking site. Okay, Pawlenty -- your Facebook strategy makes a SMIDGE more sense now. AT&T is set to buy T-Mobile for a whopping $39 billion. One less choice, but will customers have better service? Twitalyze yourself! The handy tool is now very popular thanks to the New York Times coverage. Flacks, we highly recommend updating your Twitter strategy -- those lists of Top Twitter Influencers matter, you guys! Get in with one of them for a Retweet or two and you're golden. OMG! FYI, the Oxford English Dictionary has added new initial-isms that are totes legit. LOL. Despite cuts to NASA, the retirement of the space shuttle program, and a shift toward privatization, scientists over there are still itching to land on an asteroid by 2025. Yes we can, anyone? The cherry blossoms will be back in bloom real soon. Don't miss the National Cherry Blossom Festival opening ceremony or Family Day on Saturday. For 10 bucks you can participate in Hillyer Art Space's first ever Swap Shop to trade with fellow swappers. Make sure the articles are in good shape! Want to do something a little nerdy, but still have the need for cocktails and music? The Newseum is hosting A Night at the Newseum after work today. Digest all the news and drinks at once! Oh, and don't forget to stop by at The Source for some dim-sum taste testing (yummmyyy). The National Marathon is on Saturday. Learn a little bit more about the city you live in on the fly! Online pre-registration is closed, but they have a few bibs to sell on site. 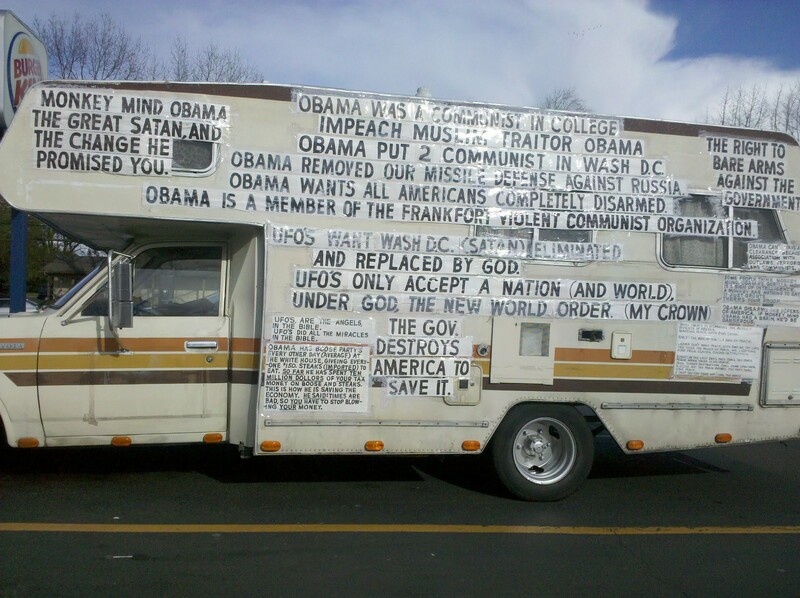 If you work near the Capitol building, head over during your lunch break to enjoy the hilarious sights and sounds of yet ANOTHER Teabagger rally. We're kinda gettin' the feeling that they actually like this city! So yeah, this week was Libya, Libya, Libya all the time, with a little disaster relief thrown in just to change up the pace. The Charlie Sheen noise piped down a bit, and the terrible jokes were replaced with people griping about how sick they are of Charlie Sheen. Okay! We get it! You're all way too cool for tiger blood! But you flacks know the real joke about this Sheen-craziness... behind every Charlie Sheen is a BRILLIANT publicist.